Many of European countries have a one-pot dish into which odds and ends of the beast and various cheap vegetables are thrown, and cooked until all components sit fall-apart tender in a rich broth. 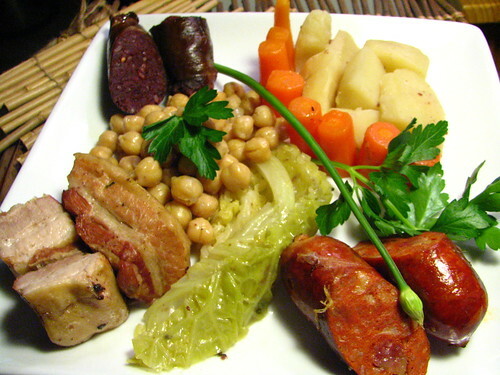 Examples include Lancashire hot-pot in the UK, the famed French pot-au-feu, and the various cocidos of Spain. Depending on where you’re eating one of these stews, you may find it all served together – the pot placed in the middle of the table for diners to dip a ladle into and fish for the tastiest morsels – or in a series of courses beginning with a soup course of the broth (caldo), followed by a vegetable course, and finally the meat. With the long-awaited advent of spring, we realized that our opportunities for making such a dish were melting away with the last rimes of dirty snow. So, armed with a foot of fresh morcilla found at the (ultimately rather disappointing) Essex Street Market, a pound of dried chickpeas, and several large slabs of pork belly (courtesy of the very magnificent Mitsuwa Japanese supermarket in Edgewater, NJ), we decided it was now or not until the fall. Everything we’d read suggested making cocido took both a long time and wasn’t easy. Happily, neither of these proved to be entirely true, and if you’ve got a couple of hours to spare one weekend, you can, with minimal preparation, make yourself a wonderfully flavorful three-course meal for 6 people without even breaking a sweat. 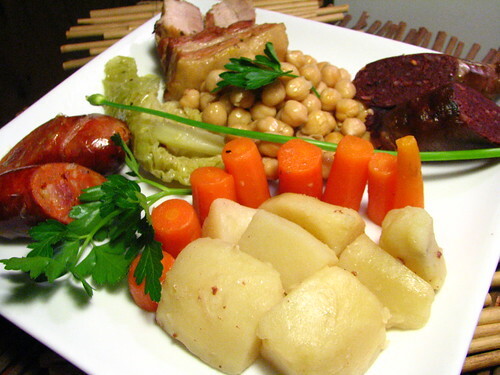 Though research suggests it doesn’t conform exactly to a typical Cocido Madrileño, this preparation closely resembles the cocido we ate in Madrid last year, and, ingredient-wise, is very similar to an Asturian-style Cocido Montañes with the exception of using chickpeas (garbanzos) instead of white beans. For us, in spite all the porky deliciousness of the meats, the broth was the best part of this dish. It was incredibly delicious and was so infused with the flavors of all the ingredients that it was impossible, even in taking a small bit of each meat and vegetable in a mouthful, to get the same flavor. Ultimately, the best thing about this cocido was not just the great satisfaction derived from a simple, peasant dish, but that it made us feel oddly wistful about the departure of winter. A feeling we did not anticipate at all. Bring to a boil and then simmer, covered, for 1 1/2 hours. Wrap chickpeas in cheesecloth, secure with kitchen twine and add to pot. Introduce chorizo to pot at this time, bring back to a boil, and simmer for another hour. Add potatoes, carrots and cabbage to pot and simmer for another 1/2 hour. Cocido is basically done at this point. Check for seasoning and correct if necessary. With a slotted spoon, remove everything from pot and place in a dish in a warm oven. 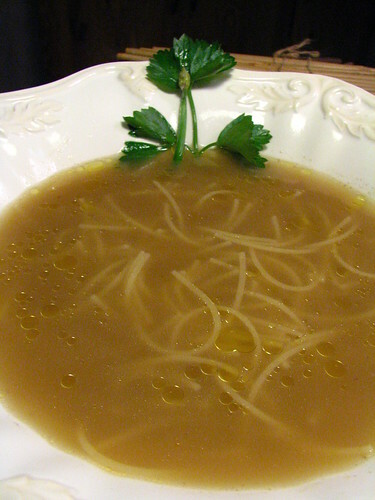 Break vermicelli into 1-2inch (2-4cm) pieces and add to broth. Serve noodle broth as first course. Plate other components (after removing chickpeas from cheesecloth bag) and enjoy with a large glass of spicy Ribero del Duero. Rub extended belly and take well-earned nap (optional). This was the first meal my senora cooked for me when I arrived in Sevilla. Unlike most other figets, I like morcilla. It is nothing in comparison to chinese blood tofu, which has an indescribable texture, neither elastic nor brittle. I love how cozy Cocido makes you feel. I’m not sure if they do this in Madrid, but in Sevilla they have the mesa camilla, a heater that is hidden under the dinner table. You tuck you legs under the mantel and the bottom half of you is warmed; the top half by eating this cocido. My roommate liked it so much so that I found her passed out under the table after a heavy night of drinking. In her inebriated lucidity she crawled under the table in seek of warmth. I dragged her back to the room. I love the little carrots all lined up like soldiers! 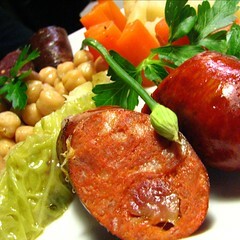 but i need to tell you something and please don’t think less of me… but – ummm… i’ve never eaten blood sausage. ever. not that i wouldn’t – i just haven’t. yet. What a scrumptious delicious meal, I’d love to have something like this in winter though. It’s so comforting. I have enjoyed Cocido in Madrid several times. You guys did a nice treatment of it here. Very authentic. This looks great! This got me thinking –Many Asian cultures do the same thing, but opposite. They cook each item individually at the table in the hot pot and then drink the broth. Either way, sounds delicious, and a lovely send off to spring. I love this kind of- one pot yielding many delicious things- cooking, I believe you about the broth, enriched with all those flavours, GOOD. I love the cheesecloth and twine notes, all very authentic. SS was right about the little carrot soldiers standing to attention, made me smile. next up Bollito misto – please ! This sounds wonderful on a rainy weekend like we’re having here. Great idea to cook everything in one pot! I grew up eating this though in my family we did it in 2 courses…the soup and then the boiled dinner. And we definitely did #16. I love everything about this (well, maybe not pig’s feet, no matter how dismantled they may be), and will definitely give it a try. I bet that broth is absolutely wonderful–eveything looks delicious! I love this kind of one-pot meal, it sounds so delicious! This is wonderful, like a deconstructed and composed stew served in courses. Very cool! Jenni – i just did a double-take. on first reading I thought you’d said “like a constructed and decomposed stew”! ha! Rachel – the cheese cloth is not only authentic but very practical too. without it you’d be chasing rogue chickpeas around the pot for ages! bollito misto is definitely next, but I think we’ll be waiting until the autumn for that. not only are we anticipating spring, but our waistlines can’t cope with another meaty, boiled dinner just yet! Stacey – glad you like the decoration. it’s tough to make a boiled dinner look good so I just played with it until it looked silly, if not beautiful! unconfidential – actually, while we could have eaten them, by the time we pulled them out of the cocido at the end, there wasn’t much left of the pig’s feet, so we didn’t eat them. Claudia – you know us here, we’re not judgmental. okay, we are judgmental, but since your intentions are to eat blood sausage, we’ll grant you a pass this time. Joan – we did the same – 2 courses. I understand that (presumably because of poverty) it used to be served in three courses so the belly could be filled with cheap broth and potatoes to make the expensive meat go further. katiek – good story. i’ve not heard of the mesa camilla, but i feel like it’s an invention i would enjoy drunk or sober. Really, you would ONLY make this in winter? Okay, I know a hot pot in the heat of summer wouldn’t be a great thing, but what about a rainy April day? It’s not as if this area is going to be terribly warm any time soon. I say screw the calendar and make what you want when you want it! Besides my love of the meats here, what really impresses me is that the vegetables still look edible. I often don’t like stews and long-cooking dishes with vegetables because I have never liked the resulting vegetable mush and the grainy bits of vegetables permeating the broth. This looks like everything held together in shape, texture and color! Meanwhile, I would love you could participate in my brand new event…. please????? What a great dish, though… I’m thinking this is something we’ll have to try. Bet all the flavors were fantastico together. This dish makes me think of what I would expect after working in the back 40 for the day. It would be worth all the hard work just to see this dish on the table. There’s so much going on one plate. Imagine the extended tummy that must follow. This is a dinner for champions! Speaking of “porky deliciousness,” my Polish fishing buddies have a very simple one-pot camping meal that is seriously porcine. They call it The Vat: pork chops browned in olive oil, sliced onions and chopped kielbasa added for several minutes of saute, then the whole kaboodle covered with a pound of kraut and left to slow-cook while you throw a couple evening dry flies to rising trout. It’s done when the pork is fall off the bone. Mmmnnnnn. That’s one-pot camp cooking! I agree with simplyheaven; AMAZING!!! You got all the good stuff in there. WOW can you send the leftovers my way? Which vendor did you get the morcilla from? I was just there the other day to get some Andouille. Incoming…I’ve got my eyes on that blood sausage…going in for the kill – stabbing my fork at that Morcilla! I love your page and I wanted to add some information for this recipe. I love eating legumes, at home we have it at least 4 times a week!!! Thank you so much, Beatriz for your wonderful comment. We love when people from the country of some of the dishes we make tell us what is good (and bad/wrong!) about our dishes. we really strive to be as authentic as possible, so thank you for telling us about the delicious-looking 3rd dish we clearly missed out on during our travels. Your english is very, very good and we really appreciate your comment. Please come by again – we have many, many spanish dishes on this blog because we love spain. This is a wonderful, underrated and underexposed dish – glad to see it get some kudos.